Good things come to those who wait, right? You bet. It took me about a month to really get into Kim Janssen’s second album Ancient Crime, back in 2012. I remember there were a lot of nice records released at the same time, records that were more easily accessible probably. But none of those are still in my rotation, except for Janssen’s. Because once I got into it, I couldn’t get out. And luckily for me, and all of us, the Dutch songwriter didn’t stop there and followed it with the equally stunning The Lonely Mountains EP (2013) and Cousins (2017). 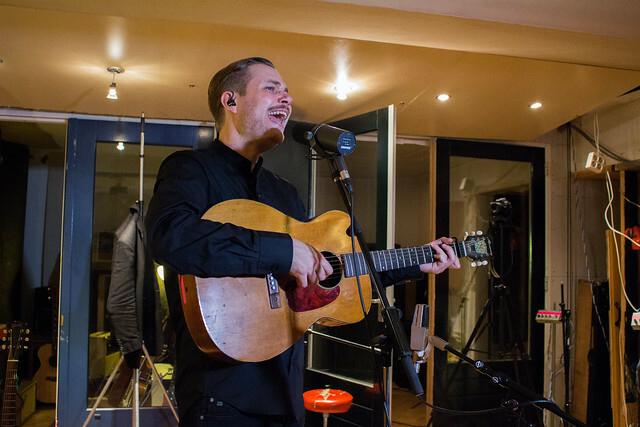 A couple of weeks ago, Janssen and his band joined us at the Schenk Studio in Amsterdam to record two astounding cover versions of Vampire Weekend’s Ya Hey and Bruce Springsteen’s Streets Of Philadelphia. ‘I’m a big Vampire Weekend fan, although I remember hating their first record’, Janssen laughs. ‘It took some time for them to grow on me. The second album was more up my alley and the third I really loved. At first listen everything seems to be just very hyper and poppy but I find it’s a layered and poetic record and the production feels fresh and original. ‘I wanted to choose a song that wasn’t too obvious for me as a singer songwriter, but also wasn’t too gimmicky. I realized Ya Hey would be perfect and that I’ve actually always wanted to do a version of it anyway. The chorus, especially, I think is beautiful. I love how Ezra Koenig uses a well-known Bible story to put God in a different light – not a far-away, all-powerful being, but a lonely person, perhaps because of all the distance and loneliness that would come with being ‘God’. Well, he succeeded don’t you think? There’s a lot more to write about Kim Janssen and at some point, I most likely will. Let’s leave it with this introduction for now though – not in the least because of the fever that’s making my head pound. In case these two incredible videos aren’t enough, and you’ve already listened to his records, why not revisit these two earlier sessions Janssen recorded with The Influences some years ago? The first one has Damien Jurado, Iron And Wine and Pedro The Lion covers, and this live one at Into The Great Wide Open includes a Sun Kil Moon cover and a traditional song. Schenk Studio, Amsterdam, The Netherlands. Audio recorded by Brian Esselbrugge and Sonya Vos. Audio mixed by Brian Esselbrugge and Kim Janssen.